Riggs Country Estates, Chandler - Careful--you just might fall in love with this extraordinary former model home in wonderful Riggs Country Estates! 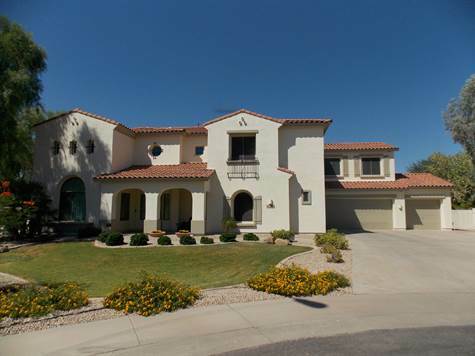 Loaded with upgrades, this 5 bedroom/4.5 bath home is a cut above the rest. A charming foyer & soaring ceilings greet you as you enter. The main level features formal living and dining rooms plus a family room with gas fireplace. There is also a den/office with custom built-ins that could be converted to a bedroom, a full bath and a powder room and a laundry room with tons of cabinets and counterspace that is perfect for a sewing/craft room. Best of all is the theater room where no expense has been spared including custom automatic theater seats, highly sophisticated sound proof walls and a charming twinkle light ceiling. The kitchen is a chef's delight with double ovens, gas cooktop with charming stone surround, island breakfast bar, butlers pantry with wine frig and an extended breakfast room with tons of cabinets. A gorgeous staircase leads to the second floor where the spacious split master suite features a sitting room, two-way gas fireplace, and access to the large balcony overlooking the back yard. The master bath features double sinks, a vanity, soaking tub with tile surround, separate walk-in tiled shower. and large walk-in closet with custom built-ins. In addition there is a loft plus 4 additional bedrooms. Like having your own private resort, the huge back yard features a refreshing pool with water features, an authentic palapa with seating area, extended covered patio, extended pavered areas and several large grassy areas. The 3-car garage boasts tons of built-in cabinets plus a workbench. There are also two storage sheds and an RV gate. All this and located in a great community with excellent Chandler schools and within easy access of freeways, shopping, dining and entertainment. Welcome home! I have seen if you are willing for the natural cause and have the better options in the life claiming opportunity for the rest or the life abandoning cause. The cause I have used is http://www.essaysworld.biz/ and make my life better than ever.